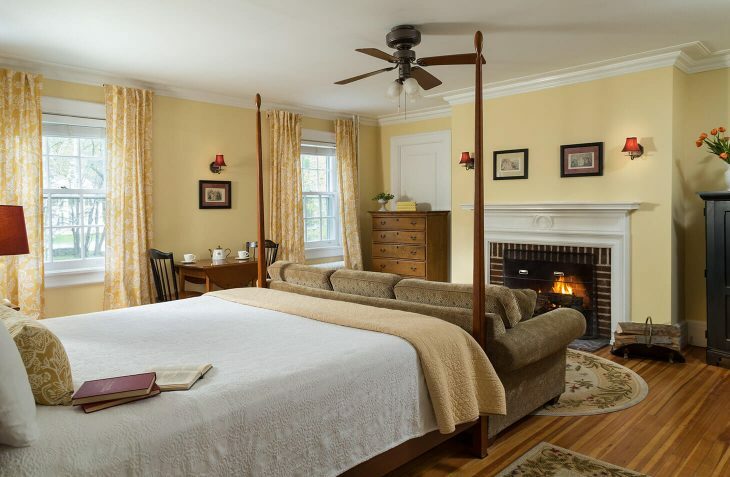 Browse our unique Vermont B&B rooms and find the perfect room for your stay. 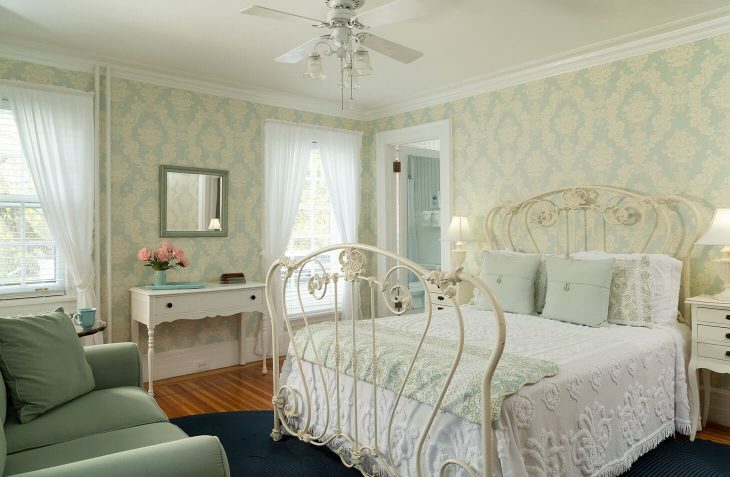 Each guest room has a private bath and a comfortable king or queen bed. For those who need to stay plugged in, you will enjoy free WIFI, cable TV and bedside power strips. Or just enjoy unwinding in our cozy cocktail lounge with a full bar or out on the patio overlooking our expansive grounds. 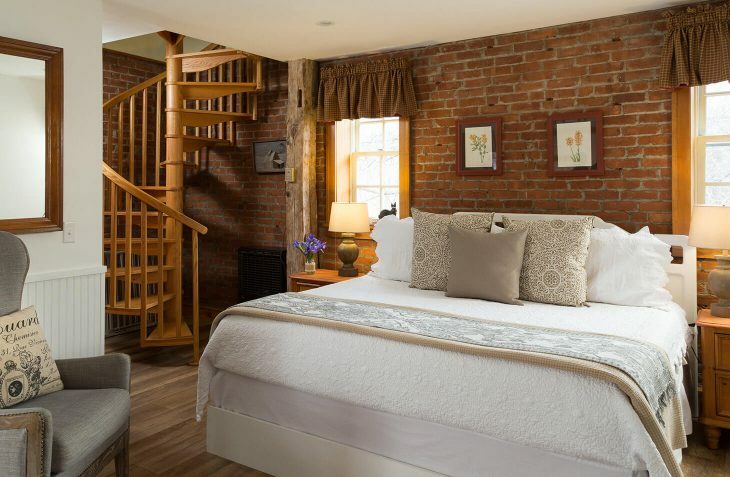 Guests looking for a romantic getaway in New England can make the trip extra memorable with one of our packages or specials. Each rooms in our historic mansion is unique. To better serve our guests with accessibility requirements, we try to describe each room’s accessibility features on our room descriptions section for your perusal. 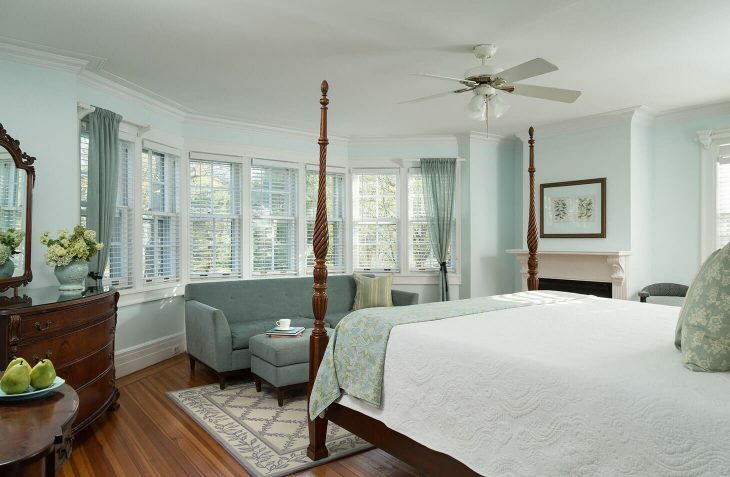 Or, you can always feel free to give us a call and we are more than happy to help match you with the perfect room suited to your individual needs. 802-447-3500 Extension 1. For more general information on general accessibility of the inn, please scroll down. Room 10 doorways are wheelchair accessible. Room 10 bathroom is equipped with toilet grab bars and wheelchair accessible sink. Tub-shower combination has grab bars and a pull-down bench-seat. It is not a wheel-in shower. Room 10 fire and CO detector have alarm and strobe-light alerts. If possible, we appreciate if you can notify us in advance that you need wheel chair accessibility. That way we can take extra care to ensure you have a comfortable arrival and enjoyable stay! For our guests using wheelchairs, you will want to park in the front parking lot (by Route 9) and wheel up the walkway to the white door in the middle of the front of the inn. (under the awning if summer). There is a small ramp (up one step) into the inn. We are happy to help you with your luggage. 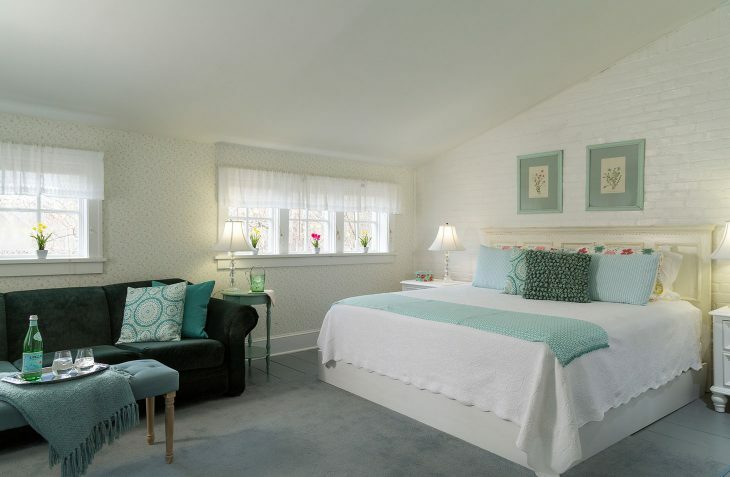 The Four Chimneys Inn room rates range from $139 – $429 depending on the specific room and time of year. 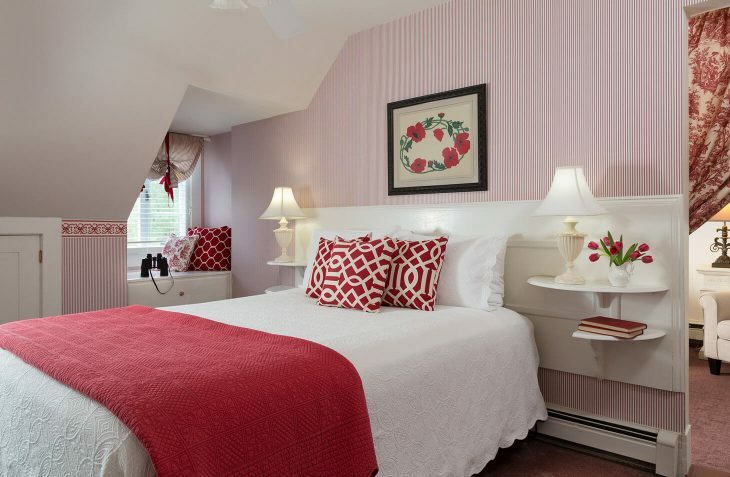 Give us a call at 802-447-3500 from 9am – 9pm if you would like help in choosing the perfect room. A hearty country breakfast is served in the dining rooms each morning and is included in the price of each room. Please note that most Saturdays (and some Fridays) require a two-night stay, but there are occasional weekends or rooms for which that is waived. (especially last minute.) Give a call and we can see if the Saturday you need might have a room available for a one-night stay. Holiday weekends and peak foliage also require a two-night stay. For best rates, book now online. Or, let us help you in person from 9 am – 9pm at 802-447-3500. Call about our corporate rates which are available Sun-Thurs for single travelers (non-foliage/non-holiday). Chances are if you are conducting business in Bennington, you are eligible for a corporate rate. Our corporate information desk is open 7 days a week from 9am – 9pm and may be reached at at 802-447-3500. Saturday stays require 2 night minimum. From June to October, Friday and Saturday stays require 2 night minimum. Rooms can be guaranteed with Visa, Master Card, American Express and Discover credit cards. Please note that the card on file is run once you are within the cancellation grace period below. In all cases of cancellation, if the credit card on file is an invalid card the property holds the right to resell the room. Please also note that Saturday night stays require a two-night stay. Whether or not charges apply, please note that your cancellation is not complete until you receive a valid cancellation number back from us. Due to our small size, cancellations affect us greatly. If you cancel up to 10 or more days (30 or more if holiday weekend) prior to your reservation date, there is no penalty. Once within the 10-day period (30 day period if holiday weekend) the credit card that is on file will be charged for non-refundable prepayment for the full amount of your stay, including the tax, with no exceptions. If you are affiliated with a group/family booking 3 or more rooms, the following cancellation policy applies. If you cancel up to 60 or more days prior to your reservation date, there is no penalty. Once within the 60-day period the credit card that is on file will be charged for non-refundable prepayment for the full amount of your stay, including the tax, with no exceptions. This group cancellation policy applies whether or not reservations are held on a single credit card or multiple cards. Please note that reservations of more than 5 rooms from one party require a separate contract. This applies whether or not reservations are held on a single credit card or multiple cards. Please call the inn at 802-447-3500 ext. 1. We welcome groups and family reunions, however we reserve the right to decline reservations associated with groups or events as they may require special contracts and deposits. A complimentary full country breakfast is served each morning in the dining room for overnight guests. Check in: 3pm – 9pm. If later than 9pm, please let us know and we can arrange for late check in. Rates are for single or double occupancy. A charge of $25.00 per person per night will be added for each person in a room over two people. Children and infants count the same as adults. 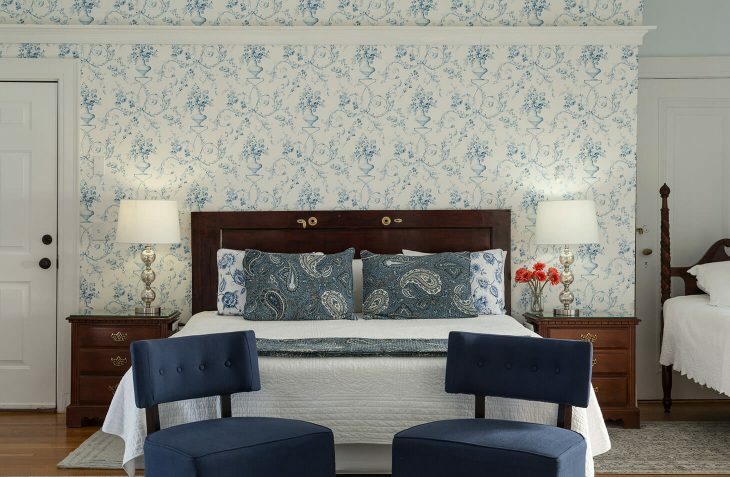 Please note that only a few rooms can accommodate more than two guests. Please notify us in advance if extra guests. The Four Chimneys is a quiet inn, however we do accept a small number of well-behaved children. 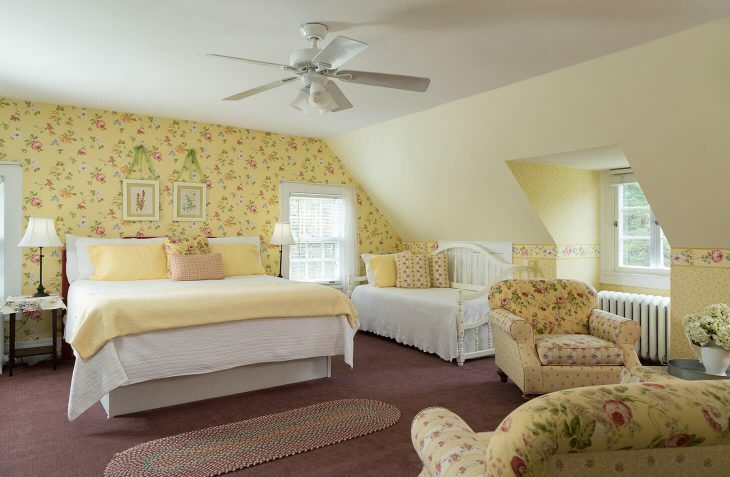 If you would like to bring your children, please advise us at the time of reservation to discuss bedding options because most rooms accommodate only two adults. 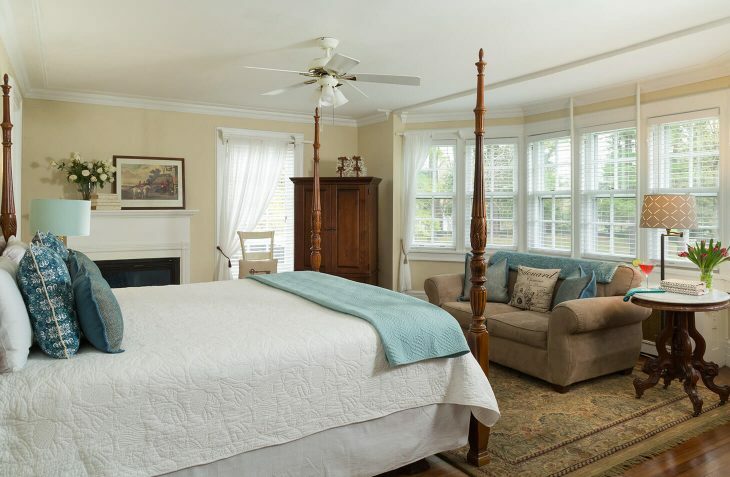 We are happy to help match you to a room that would best accommodate your needs. Please note that extra person charges above apply to children, infants and adults alike. The Four Chimneys Inn and Restaurant is a fully non-smoking facility. A $200 charge plus any lost revenue will be added to your bill if an indication of smoking is detected, or if additional cleaning is required from a violation of this policy. Pets are not allowed as we have no facilities to accommodate them. While we love animals, pets and animals are not allowed in any part of the inn or on the grounds. A $200 charge plus any lost revenue will be added to your bill if an indication of an animal or damage from an animal is detected, or if additional cleaning is required from a violation of this policy. Often times our guests traveling with pets will board their pets at Mt. Anthony Veterinary Clinic which is across the street about 1 mile down the road. Please note that professional photographers are allowed on the grounds only for couples who book their elopement package or hold their reception at The Four Chimneys. For our guests using wheelchairs, you will want to park in the front parking lot (by Route 9) and wheel up the walkway to the white door in the middle of the front of the inn. (under the awning if summer). There is a small ramp (up one step) into the inn. We are happy to help you with your luggage. If you would like to notify us in advance that you need wheel chair accessibility, we will take extra care to ensure you have a comfortable arrival and enjoyable stay!